Dexter Daily: Michael C. Hall: "Sometimes I Wish Dexter Had Died"
Michael C. Hall: "Sometimes I Wish Dexter Had Died"
via IGN: It’s been about eight months since we saw Dexter Morgan meet his log-cabin fate. Showtime, however, has been reluctant to let go of their successful serial killer series. There’s been talk of not just a Dexter spin-off series, but a Dexter spin-off series featuring none other than…Dexter. IGN had the chance to speak with the Dark Defender himself, Michael C. Hall, recently for his upcoming crime drama Cold in July. During the conversation, IGN touched on the proposed Dexter spin-off series, to which the actor responded that he had, “no immediate plans” to revisit the role. Hall joked that this one would be the show in which Dexter "goes around chopping down all of the bad trees." Adding in a more serious vein that he'd "learned to never say never." "It's very difficult for me to imagine someone coming up with something that is compelling enough for that to be worth doing," Hall continued. "I certainly have no interest right now in playing Dexter. You know, some time passes and somebody has some newly imagined landscape for him that I feel is worth exploring, I would perhaps consider it. Beyond that vague notion, I really can't say, and it's not something I have any immediate plans to do. He is still alive, but for right now, I'm leaving him in the cabin." When asked if it may have been a more fitting end for Dexter to not survive that raging tempest, the actor acknowledged that it may have been, noting that the final season of the show was rocky. 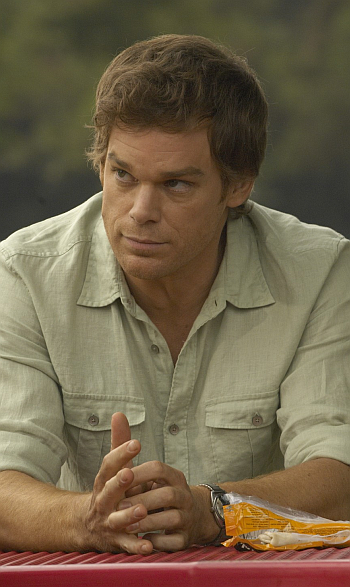 "You know, Dexter morphed," Hall said. "It was a many-headed creative monster, and certain heads were lopped off halfway through the life of the show. It was difficult to maintain a cohesive narrative in many ways, but primarily, in terms of the conception of the character, once he started to move into murkier, blurrier, more human territory, it became a very difficult thing to wrap my head around. But in the end, I think Dexter was always a pragmatist and, well, self-centered. I think it was his version of selflessness upon recognition that anyone close to him was going to be destroyed if he continued to indulge in intimate relationships. You know, his dad died, Rita died -- well, once he decided that, he faked his death and erased himself, but he didn't want to die. I honestly find it to be a pretty dark ending, and I think it upset a lot of people. Certainly, the shakiness of certain aspects of the eighth season maybe made that ending less palatable to people. I don't think people were ready to be told that, because they were already feeling a sense of ambivalence for the show. But the idea that he imprisons himself in a prison of his own making I think is fitting [for the character]." “It's tricky,” Hall reflected. “Sometimes I wish he'd offed himself, wish he'd died, wish Deb had shot him in that train compartment -- of course, that would have made an eighth season difficult to do,” the actor reflected wryly.